Free radicals are highly reactive molecules generated predominantly during cellular respiration and normal metabolism. Imbalance between cellular production of free radicals and the ability of cells to defend against them is referred to as oxidative stress (OS). OS has been implicated as a potential contributor to the pathogenesis of acute central nervous system (CNS) injury. After brain injury by ischemic or hemorrhagic stroke or trauma, the production of reactive oxygen species (ROS) may increase, sometimes drastically, leading to tissue damage via several different cellular molecular pathways. Radicals can cause damage to cardinal cellular components such as lipids, proteins, and nucleic acids (e.g., DNA), leading to subsequent cell death by modes of necrosis or apoptosis. The damage can become more widespread due to weakened cellular antioxidant defense systems. Moreover, acute brain injury increases the levels of excitotoxic amino acids (such as glutamate), which also produce ROS, thereby promoting parenchymatous destruction. Therefore, treatment with antioxidants may theoretically act to prevent propagation of tissue damage and improve both the survival and neurological outcome. Several such agents of widely varying chemical structures have been investigated as therapeutic agents for acute CNS injury. Although a few of the antioxidants showed some efficacy in animal models or in small clinical studies, these findings have not been supported in comprehensive, controlled trials in patients. Reasons for these equivocal results may include, in part, inappropriate timing of administration or suboptimal drug levels at the target site in CNS. Better understanding of the pathological mechanisms of acute CNS injury would characterize the exact primary targets for drug intervention. Improved antioxidant design should take into consideration the relevant and specific harmful free radical, blood brain barrier (BBB) permeability, dose, and time administration. Novel combinations of drugs providing protection against various types injuries will probably exploit the potential synergistic effects of antioxidants in stroke. Stroke is a sudden loss of brain function resulting from interference with the blood supply to the central nervous system (CNS1). Acute stroke can be classified either as ischemic (80% of stroke cases), which can be further classified to extra-cranial embolism and intracranial thrombosis, or a hemorrhagic stroke (20% of stroke cases), which can be further classified to intracerebral hemorrhage and subarachnoid hemorrhage (SAH; Fig. 1). Cellular mechanisms that may be involved in acute ischemia and CNS injury. A free radical is any chemical compound that contains one or more unpaired electrons in its outer orbits. Unpaired electrons alter the chemical reactivity of an atom or molecule, usually making it more reactive than the corresponding nonradical, because they act as an electron acceptor and essentially “steal” electrons from other molecules. This electron loss is called oxidation and free radicals are referred to as oxidizing agents (Halliwell and Gutteridge, 1989). Humans are constantly exposed to free radicals created by external sources from the environment (e.g., radon and cosmic radiation) or man-made and by internal cellular metabolisms. The most commonly occurring cellular free radical is superoxide radical (O2⨪ ), which is produced when an oxygen molecule gains one electron from another substance. Excess amount of O2⨪ leads to tissue damage by promoting hydroxyl radical (OH⋅) formation through hydrogen peroxide (H2O2) (the iron-mediated Haber-Weiss reaction; Jenner and Olnaw, 1996; Simonian and Coyle, 1996; Fig. 3A). Alternatively, O2⨪ may lead to OH⋅ formation through an interaction with endogenously formed nitric oxide (NO⋅) by nitric oxide synthetase, an enzyme that is concentrated in certain neurons and activated by Ca2+. The interaction of NO⋅with O2⨪ leads to the formation of peroxynitrite (ONOO−), which can generate nitrosyl radical (ONOOH), which decomposes to form OH⋅ (Fig. 3B). Free radicals and related molecules are often classified together as reactive oxygen species (ROS) to signify their ability to lead to oxidative changes within the cell (Simonian and Coyle, 1996). These radicals can cause cellular damage to cardinal cellular components such as lipids. Polyunsaturated fatty acids are particularly vulnerable to free radical attack, because the double bonds within membranes allow easy removal of hydrogen ions by ROS such as OH⋅ (Halliwell and Gutteridge, 1989). Free radicals can also damage proteins and nucleic acids (e.g., DNA), leading to subsequent cell death by mode of necrosis or apoptosis. Cells normally have a number of mechanisms acting to defend against damage induced by free radicals (Evans, 1993; Simonian and Coyle, 1996). Problems occur when production of ROS exceeds their elimination by the antioxidant protective systems or when the latter are damaged. This imbalance between cellular production of ROS and the inability of cells to defend against them is called oxidative stress (OS) (Ebadi et al., 1996; Jenner and Olnaw, 1996; Simonian and Coyle, 1996). OS is involved in acute and chronic CNS injury and is a major factor in the pathogenesis of neuronal damage (Facchinetti et al., 1998). Reactive oxygen species reactions that may lead to OH⋅ production. NADP, nicotinamide adenine dinucleotide phosphate; NADPH, reduced form of NADP; NOS, nitric oxide synthetase. 1. Oxidative Stress-Mediated Brain Damage. Some of the pathological processes in acute CNS injury involve the generation of oxygen free radicals either as a cause or a result of disease progression (Love, 1999; Lewen et al., 2000). Free radicals are generated by the constant use of oxygen in the mitochondria to supply the energy needs of the brain. Some enzymes expressed in the brain including monoamine oxidase, tyrosine hydroxylase, andl-amino acid oxidase produce H2O2 as a normal byproduct of their activity. The activity of other neuronal enzymes yields oxidants such as the Ca2+-dependent activation of phospholipase A2. That may lead to arachidonic acid release, producing O2⨪ through its subsequent metabolism by lipoxygenases and cyclo-oxygenases to form eiconasoids. Auto-oxidation of endogenous substances, e.g., ascorbic acid and catecholamines, may yield high levels of H2O2 (Coyle and Puttfarcken, 1993). Therefore, ROS have been the focus of interest as possible candidates for the elicitation of various pathological responses in the pathogenesis of acute CNS injury and as a therapeutic target (Bromont et al., 1989; Hall, 1989; Oliver et al., 1990). It is well known that glial cells are more resistant to OS than neurons, probably due to transcriptional up-regulation of glutathione synthesis (Rice and Russo-Menna, 1998; Iwata-Ichikawa et al., 1999). Studies have demonstrated that free radicals play an important role in the pathogenesis of ischemia, especially superoxide, which was shown to produce during the reperfusion phase and interact with NO⋅, leading to peroxynitrite formation (Cazevielle et al., 1993). Love et al. (1999) showed that free radicals and related ROS mediate much of the damage that occurs after transient brain ischemia and in the penumbral region of infarcts caused by permanent ischemia. Demirkaya et al. (2000) found that patients with acute ischemic hemispheric stroke had significantly higher levels of malondialdehyde in their red blood cells on the first and seventh days after stroke onset, compared with controls. Moreover, superoxide dismutase (SOD) and glutathione peroxidase activities were significantly decreased compared with control subjects. These results showed a significant correlation with infarct size, initial stroke severity, and poor short-term prognosis. Other acute CNS injuries like SAH and trauma also involve ROS production. Gaetani et al. (1998) have shown an imbalance of the antioxidant enzymatic activities in the human brain after SAH. This antioxidant imbalance precedes the occurrence of symptomatic vasospasm in patients undergoing an operation in the early stage of SAH. The presence of free hemoglobin in nerve tissue may also exacerbate the potential for ROS-effected damage caused by the appearance of free iron salts (Sandrzadeh et al., 1987). Taking all that together, treatment with free radical scavengers and antioxidants is a rational therapeutic strategy for stroke or CNS trauma. One of the first pathophysiological events leading to neuronal damage in acute CNS injury involves glutamate accumulation in the extracellular space. Glutamate is the major excitatory amino acid among the excitatory amino acids (EAA) in the brain, acting mainly through activation of its ionotropic receptors. These receptors can be distinguished by their pharmacological and electrophysiological properties: the α-amino-3-hydroxy-5-methyl-4-isoxasole-proprionic acid, kainic acid, and the N-methyl-d-aspartate (NMDA) receptors. Activation of these receptors leads to depolarization and neuronal excitation. However, if for any reason receptor activation becomes excessive or prolonged, the target neurons become damaged and eventually die. In the ischemic brain, extracellular glutamate is elevated rapidly after the onset of ischemia and declines after reperfusion. The mechanisms that are responsible for the elevation of extracellular glutamate include enhanced efflux of glutamate and the reduction of glutamate uptake. This process seems to involve sustained elevations of intracellular calcium levels through glutamate transporters operating in the reverse mode, and owing to imbalance of sodium ions across plasma membranes. Moreover, the fact that the brain can neither synthesize nor store energy reserves, means that any interruption in cerebral blood flow may lead to rapidly and irrevocably energy failure and dramatic fall in intracellular levels of ATP. The consequences will be an increase in the concentrations of extracellular glutamate and neuronal sensitization to excitotoxic cell death. It is well established that high levels of glutamate in the extracellular space appear rapidly after the onset of ischemia. Nevertheless, a direct linkage between the enhanced release of glutamate and the neuronal injury has not been fully established (Coyle and Puttfarcken, 1993; Bondy, 1995; Doble, 1999). Pharmacological studies in rodents and recent clinical studies in humans have shown that the extra-neuronal concentration of glutamate rose to toxic levels under ischemic (Benveniste et al., 1984; Hagberg et al., 1985; Siesjo, 1992a,b;Bullock et al., 1995; Davalos et al., 1997) and traumatic (Faden et al., 1989) conditions. In addition, NMDA antagonists that were added to neuronal cultures, rescued cells treated with glutamate receptor agonists. Neuroprotection can be achieved by blocking the presynaptic release of glutamate and/or by blocking the excitation of postsynaptic neurons occurring after an ischemic episode. In this regard, the voltage-sensitive calcium channels and glutamate receptors may be suitable targets for therapy (Coyle and Puttfarcken, 1993; Nishizawa, 2001). 3. Oxidative Stress and Excitotoxicity. It is well known that EAA and neurotransmitters, whose metabolism produces ROS, are unique in the brain as sources of OS (Coyle and Puttfarcken, 1993). It has been proposed that during CNS, ROS (mainly O2⨪ and NO⋅) and EAA (mainly glutamate) may cooperate in the pathogenesis of neuronal damage, involving loss of cellular calcium homeostasis (White et al., 1984; Bose et al., 1992; Siesjo, 1993). The chain of occurrences has not been well established. Excitatory events may stimulate ROS, and there is evidence that ROS can lead to release of EAA, suggesting a bi-directional relationship (Pellegrini-Giampeitro et al., 1990). Several studies provide evidence that the two phenomena are interrelated. Transient ischemia elevates cerebral levels of both excitatory amino acids and rates of hydroxyl radical formation (Delbarre et al., 1991). The resultant low oxygen supply in the brain tissue after CNS injury can lead to reduced energy supply. This anabolic deficit may then result in diminution of the ionic gradients across the plasma membrane. The influx of extracellular calcium may then stimulate release of neurotransmitters including glutamate. In addition, the capacity of the energy-requiring high-affinity re-uptake systems is diminished. Thus, extracellular levels of glutamate may rise. A hyperexcitable state will ensue, resulting from both the reduced axonal membrane potential and increased calcium-stimulated neurotransmitter release. Subsequent reperfusion will lead to an abrupt return of glucose and oxygen to neurons, which disrupts mitochondrial function. Such uncoupling will then increase the generation rate of ROS. Elevated intracellular calcium will also exacerbate ROS levels by phospholipase activation. This will initiate a cycle leading to increasingly severe neuronal damage. The above mechanism may explain why both ROS scavengers and calcium channel antagonists afford protection against ischemic states. The role of NO in hypoxic neuronal damage is ambiguous. Influx of calcium into the cell can activate NO synthetase, thus increasing NO levels. This radical can interact with the superoxide radical to form the intensely reactive nitroperoxyl radical, which can be a cytotoxic mediator in neuronal injury during stroke and NMDA activation (Cazevielle et al., 1993; Fagni et al., 1994). However, nitric oxide has also been found to be neuroprotective, perhaps by reducing the toxicity of hydrogen peroxide (Wink et al., 1993). Thus, under some circumstances, inhibition of NO synthesis can potentiate excitotoxicity (Hayberry et al., 1992). The dual nature of nitric oxide may best be accounted in terms of its ability either to exacerbate the harmfulness of some oxidant species such as superoxide or to form less reactive compounds such as hydrogen peroxide. The effect of NO may then depend on the precise ROS species that are coexisting in the tissue. Taken together, it is now clear that tissue damage associated with excitotoxicity may be blocked, not only by antagonists of EAA receptors, but also by agents that inhibit generation of ROS (e.g., O2⨪ and NO⋅). Such approaches include agents that inhibit ROS producing enzymes (e.g., nitric oxide synthetase or xanthine oxidase) and ROS scavenging agents. 4. Oxidative Stress-Induced Gene Expression. A large number of gene products appear after an ischemic insult, making it difficult to decipher which genes are really involved in the mechanism of tissue injury. ROS were shown to influence gene expression and to play a role in the events that lead to neuronal death. In global cerebral ischemia, the oxidative responsive transcription factor, nuclear factor-κB (NF-κB), is persistently activated. Overall, persistent NF-κB activation enhances ischemic neuronal death (Schneider et al., 1999), but its effects differ between cell types. Activation of NF-κB in neurons induces production of anti-apoptotic gene products and proteins involved in modulating synaptic plasticity and increases their survival after stroke. Activation of NF-κB in glial cells (astrocytes and microglia) results in the production of proinflammatory cytokines and potentially neurotoxic ROS and excitotoxins, thus, promoting ischemic neuronal degeneration (Mattson and Camandola, 2001). The NF-κB translocation into the nucleus and binding to the NF-κB site can activate many inducible genes, including but not only cyclooxygenase-2, inducible nitric oxide, metalloproteinases, intercellular adhesion molecules, and cytokines. The expression of these genes may lead to formation of ROS and BBB breakdown, which may lead to apoptosis or necrosis or both (Chan, 2001). In addition to NF-κB, many transcription factors such as AP-1, HIF-1, SP-1, and EIK-1 are known to be redox-sensitive proteins (Sen, 1998), and their regulation of gene expression by OS in cerebral ischemia has yet to be determined (Sharp et al., 2000). The BBB is a major barricade that separates the brain microenvironment from the blood within the cerebrovascular tree to allow complex neural signaling without external interference. According to ultrastructural studies, endothelial cells in the brain differ fundamentally in two ways from those in peripheral tissues. First, they have very few endocytotic vesicles, limiting the amount oftrans-cellular flux. Second, they are coupled by tight junctions or a zipper-like structure that seal the intercellular cleft and restrict par-cellular flux (Reese and Karnovsky, 1967). Normally, the tight junctions of the BBB permit the diffusion of only very small amounts of water-soluble compounds (par-cellular aqueous pathway), whereas the large surface area of the lipid membranes of the endothelium offers an effective diffusive route for lipid-soluble agents (trans-cellular lipophilic pathway; Rowland et al., 1992). Pathological permeability of BBB may occur after closed head injury (CHI) and SAH, enabling easier drug penetration to the brain. In other acute CNS injuries such as cerebral ischemia, the BBB is intact, at least in part, leading to reduction in drug penetration into the brain. This problem has prompted researchers to develop methods to induce transient opening of the tight junctions of the brain endothelial cells, such as osmotic opening with mannitol or arabinose (Gumerlock and Neuwelt, 1992). Antioxidants are exogenous (natural or synthetic) or endogenous compounds acting in several ways including removal of O2, scavenging reactive oxygen species or their precursors, inhibiting ROS formation and binding metal ions needed for catalysis of ROS generation. The natural antioxidant system can be classified into two major groups: enzymes and low molecular weight antioxidants (LMWA). The enzymes include SOD, catalase, peroxidase, and some supporting enzymes. The LMWA group of molecules can be further classified into directly acting antioxidants (e.g., scavengers and chain breaking antioxidants) and indirectly acting antioxidants (e.g., chelating agents). The former are extremely important in defense against OS. This subgroup currently contains several hundred compounds. Most of them, including ascorbic and lipoic acids, polyphenols, and carotenoids, are derived from dietary sources (Shohami et al., 1997). The cell itself synthesizes a minority of these molecules, such as glutathione and NADPH. The distribution of protective antioxidants in the body has some interesting features. For instance, there is a relatively high concentration of the water-soluble antioxidant vitamin C in the brain. However, vitamin E concentrations in CNS are not remarkably different from those in other organs. The concentrations of antioxidants also vary within the different regions of the brain itself. For instance, the lowest concentration of vitamin E is found in the cerebellum (Vatassery, 1992). It was also shown that enzymatic antioxidants, such as catalase, are in lower concentrations in the brain than in other tissues. As with other neuroprotectants, to achieve high efficacy, antioxidants must penetrate through the BBB, and be given as early as possible and within the “neuroprotective window” (the time interval where they significantly reduce or prevent cerebral damage). The therapeutic window for successful attenuation of an infarct volume was shown to be 3 to 4 h in rats (Kaplan et al., 1991; Memezawa et al., 1992) and cats (Heiss and Rosner, 1983) and 6 to 8 h in nonhumans primates (Jones et al., 1981). Current early-phase trials of neuroprotectants in stroke (e.g., NMDA antagonists) adhered to the 4- to 6-h time frame within which tissue rescue may be possible (Ginsberg, 1994; Pulsinelli, 1995). This is supported by statistical analysis of relevant animal studies suggesting that irreversible focal injury begins within a few minutes and is complete within 6 h (Zivin, 1998). An important finding of epidemiological studies on stroke is the lower risk of cerebral ischemic events among individuals with frequent consumption of fruit and vegetables (Acheson and Williams, 1983; Vollset and Bjelke, 1983; Joshipura et al., 1999). The specific nutrients responsible for this effect remain elusive, but antioxidant vitamins, such as vitamin E, β-carotene, and vitamin C, which are free radical scavengers, may be major contributing factors to this phenomenon. Vitamin E is a fat-soluble vitamin known to be one of the most potent antioxidants. It breaks the propagation of the free radical chain reaction in the lipids of biological membranes. Vitamin E deficiency in humans is caused by either fat malabsorption or genetic abnormalities, leading to peripheral neuropathy and ataxia (Traber and Sies, 1996). Low levels of antioxidants such as vitamin E, ascorbic acid, and reduced glutathione (GSH) could lead to tissue peroxidation disability in rats. Vitamin E deficiency also influences the activities of SOD, catalase, and glutathione peroxidase (De Kumar and Rukmini, 1988). Carotenoids are also natural lipid-soluble antioxidants (Bendich, 1993). β-Carotene is the best-known carotenoid due to its importance as a vitamin A (retinol) precursor. β-Carotene possesses antioxidant activity somewhat analogous to that of vitamin E. Studies showed that within 24 h after the clinical event, acute ischemic stroke patients had lowered levels of carotenoids and vitamin E as compared with matched controls (Chang et al., 1998). Vitamin C (ascorbic acid) is a water-soluble antioxidant that is found throughout the body as the ascorbate anion. 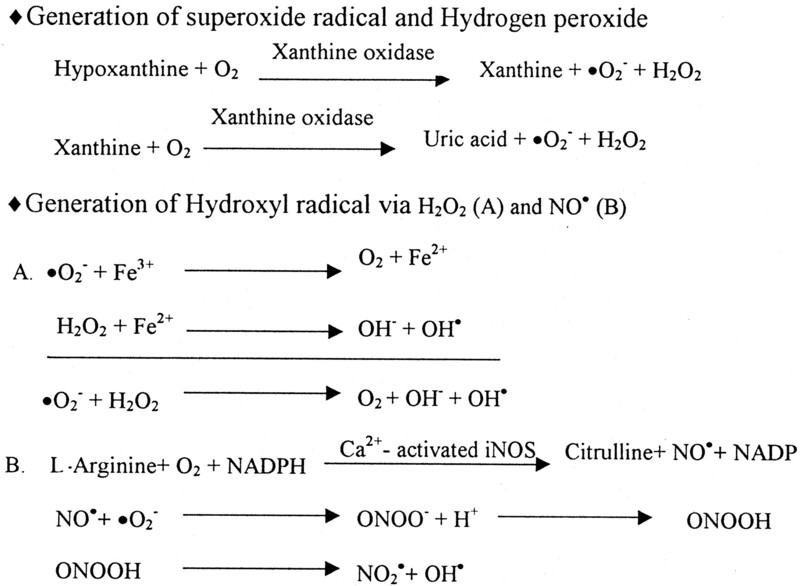 It inhibits peroxidation of membrane phospholipids and acts as a scavenger of free radicals (Padh, 1990; Rice, 2000). Another important role of vitamin C is the regeneration of vitamin E (Chan, 1993). Brain concentration of vitamin C is 10-fold higher than its plasma levels (Frei and England, 1989;Schreiber and Trojan, 1991; Rose and Bote, 1993). This may indicate its potential role as a cerebro-protective agent. Epidemiological studies examining the correlation between antioxidant vitamin consumption and stroke incidence and mortality produced conflicting results. On the one hand,Gey et al. (1993), Keli et al. (1996), and Daviglus et al. (1997) found that increased antioxidant vitamin intake resulted in a decreased risk of stroke. On the other, two randomized trials showed that β-carotene supplements (Hennekens et al., 1996) and intake of other antioxidant vitamins (Blot et al., 1993) were not associated with a reduced stroke risk. Yochum et al. (2000) found an inverse association between stroke mortality and dietary vitamin E in postmenopausal women. These conflicting results may indicate that only people with extraordinarily low OS and BBB disruption will benefit from vitamin E supplementation. OPC-14117, a vitamin E analog, was found to attenuate edema formation and behavioral deficits after cortical contusion in rats (Kawamata et al., 1997). MDL 74,722,another vitamin E analog, was found to reduce infarct volume by 49% after transient middle cerebral artery occlusion (MCA-O) in rats (Van der Worp et al., 1999). To summarize, epidemiological studies preformed using vitamins to prevent stroke demonstrated conflicting results. The inconsistent results can be explained by the fact that vitamin C and vitamin E may be oxidized to form ascorbyl radical and α-tocopherol radical, which may act as toxic pro-oxidants in some ischemic circumstances (Dyatlov et al., 1998; Rice, 2000). No controlled clinical study was performed to verify whether vitamins may be beneficial as a treatment for acute stroke patients. Thus, vitamins may reduce stroke complications only if they are given at a specific dose, and within specific time window. Moreover, it may be that vitamins are beneficial only when the severity of stroke is mild with a low OS level in the ischemic zone. Coenzyme Q10 (ubiquinone) is a mobile and lipid-soluble compound within the hydrophobic core of the phospholipid bilayer of the inner membrane of the mitochondria. It is an essential cofactor in the electron transport chain, where it accepts electrons from complexes 1 and 2 (Beyer, 1992; Ernster and Dallner, 1995; Do et al., 1996). Coenzyme Q10 also serves as an important antioxidant in lipid membranes (Noack et al., 1994; Forsmark et al., 1997) either directly or by regenerating vitamin E. Its levels are known to decrease with age in both human and rat tissues (Beyer et al., 1985; Kalen et al., 1989; Battino et al., 1995). This decrease may be caused by reduced synthesis or age-dependent increases in lipid peroxidation (Forsmark et al., 1997). The effect of coenzyme Q10 on the survival of Mongolian gerbils with unilateral carotid ligation-induced stroke was examined. The control stroke gerbils died within 24 h. However, with a subcutaneous implantation of a 250-mg pellet of coenzyme Q10, an improvement was observed, with 45% survival at 4 weeks (Ogawa et al., 1986). Another study showed that oral administration of coenzyme Q10 (10 mg/kg per 6 days) prevented the development of ischemic brain lesions in a rabbit model of SAH-induced symptomatic vasospasm (Grieb et al., 1997). More studies should be performed to evaluate coenzyme Q10 efficacy in acute CNS injury. Melatonin (N-acetyl-5-methoxytryptamine) is an indoleamide secreted by the pineal gland, which has structural similarities to serotonin. Melatonin is known as a biological modulator of many physiological mechanisms (e.g., circadian rhythms and sleep). It is highly lipophilic and, when administered exogenously, can readily cross the BBB and gain access to neurons and glial cells. There is experimental evidence that melatonin influences aging and age-related processes and disease states (Beyer et al., 1998). These roles are apparently related to its potency as a free radical scavenger (Beyer et al., 1998). Several studies have examined the neuroprotective effects of melatonin as an antioxidant in cerebral ischemia. Borlongan et al. (2000) showed that oral administration of melatonin, 1 h before MCA occlusion in rats, significantly enhanced glial cell survival. Moreover, another study showed that pinealectomy in rats increases the infarct volume after MCA occlusion. Injection of melatonin (4 mg/kg) to pinealectomized rats before both ischemia and reperfusion reduced infarct volume by 40%. Melatonin also significantly improved neurological deficit scores in pinealectomized and in the sham-operated group subjected to MCA occlusion (Manev et al., 1996; Kilic et al., 1999). It was found to decrease the infarct area, prevent neuronal death after MCA-O for 1 h in rats and increase the expression of neuronal bcl-2 in the penumbral area of the ischemic brain (Ling et al., 1999). This may suggest that melatonin has a potential role in inhibiting apoptosis after cerebral ischemia. However, melatonin treatment may be problematic due to its various physiological roles and multiple undesirable side effects. α-Lipoate is a LMWA absorbed from the diet, which crosses the BBB (Packer, 1992; Packer et al., 1997). It is intracellularly reduced to dihydrolipoate, which is exported to the extracellular medium. Both α-lipoate and especially dihydrolipoate are potent antioxidants and reduce lipid peroxidation. Hence, protection is potentially afforded to both intracellular and extracellular environments. α-Lipoate was shown to scavenge hydroxyl radicals, singlet oxygen, and nitric oxide. In addition, α-lipoate chelates a number of transition metals, recycles other antioxidants (such as vitamin C and vitamin E), raises intracellular levels of glutathione, and modulates transcription factors activities, especially that of NF-κB (Packer et al., 1997; Packer, 1998). Prehn et al. (1992) and Backhaus et al. (1992) found that treatment with dihydrolipoate, but not with α-lipoate, reduced infarct size after MCA occlusion in mice. Others reported a protective effect of α-lipoate, only when given subcutaneously, but not intraperitoneally or intracisternally. It was found that the S-enantiomer was more effective than the R-enantiomer when administered only 1 h before ischemia (Woltz and Krieglstein, 1996). Cao and Phillis (1995) observed a protective effect of α-lipoate against ischemia-reperfusion injury in the Mongolian gerbil model. Gerbils treated with α-lipoate for 7 days before ischemia-reperfusion exhibited less change in locomotor activity and less damage to the CA1 hypocampal pyramidal cell layer, than the saline-treated controls. Controlled clinical studies should be performed to evaluate its advantages in acute CNS injury. Glutathione peroxidase, in both selenium-dependent and -independent forms, is one of the major enzymes responsible for the degredation of hydrogen peroxide and organic peroxides in the brain. The seleno-organic compound ebselen has antioxidant activity through a glutathione peroxidase-like action. This data has led to extended research of this molecule (Muller et al., 1984; Wendel et al., 1984). Johshita et al. (1990) showed that ebselen significantly ameliorated the postischemic hypoperfusion after MCA occlusion. Another study showed that oral ebselen administration (30 mg/kg) 40 min before MCA occlusion in rats reduced the volume of ischemic damage in the cerebral hemisphere and cerebral cortex by 48 and 53%, respectively (Dawson et al., 1995). Takasago et al. (1997)showed that 10 mg/kg ebselen administration reduced the volume of ischemia in the cerebral hemisphere and cerebral cortex by 31.8 and 36.7%, respectively, in a rodent model of focal cerebral ischemia (permanent MCA occlusion). Ebselen (50 mg/kg) ameliorated delayed cerebral vasospasm as detected angiographically in a canine model of SAH (Watanabe et al., 1997). Based on encouraging evidence of the neuroprotective role of ebselen in animal models, Saito et al. (1998)conducted a randomized, placebo-controlled clinical study in 286 SAH patients. Ebselen, given orally at a dose of 300 mg per person per day for 2 weeks, did not affect the incidence of symptomatic vasospasm but significantly ameliorated delayed ischemic neurological deficits and subsequent cerebral infarction, leading to an improvement in the overall outcome. In humans, this compound has come to be regarded as a neuroprotective agent rather than an antivasospastic agent. In 300 patients with acute ischemic stroke, treatment with ebselen (150 mg twice a day for 2 weeks) within 48 h of stroke onset showed, at 1 month, a significantly improved outcome, as measured by the Glasgow outcome scale (Yamaguchi et al., 1998). The improvement was maintained at 3 months, although this failed to reach statistical significance.Ogawa et al. (1999) conducted a randomized, double-blind, placebo-controlled trial of ebselen in 99 patients with complete MCA-O. Ebselen (150 mg) was given orally within 12 h of onset and continued for 2 weeks. There was a corresponding significant reduction in the volume of cerebral infarct and an improvement in the outcome of patients who had started treatment within 6 h of onset. These findings suggest that ebselen may protect the human brain from ischemic damage in the acute stage. Ebselen was given in optimal administration route (i.v. ), providing rapid and controlled delivery of the drug into the brain and is now in phase 3 clinical stroke trials. These preliminary clinical results are promising, but further studies are needed to establish its beneficial effects in stroke. 6. Human Superoxide Dismutase/Superoxide Dismutase-Like Molecules. SOD converts superoxide to hydrogen peroxide (H2O2) and represents the first line of defense against oxygen toxicity. Three forms have been described in man: The first isoform, containing copper and zinc at its active site (Cu/Zn SOD-1), is found in the cytoplasm of cells. Another isoform, containing manganese at its active site, is located in the mitochondria (Mn SOD-2). The third isoform is present in extracellular fluids such as plasma (Cu/Zn SOD-3). It was found that the traces of copper, zinc, and manganese metals are essential for maintaining the antioxidant activity of SOD (Halliwell, 1994). Preischemic administration of recombinant human SOD has been reported to attenuate the ischemic damage induced in gerbils by 5-min bilateral carotid artery occlusion (Tagaya et al., 1992). Further studies have shown that transgenic mice expressing the human Cu-Zn isoform (SOD-1) have a reduced infarct volume after MCA occlusion. Nitroxides, which are cell-permeable, nontoxic stable radicals, display SOD-like activity. Beit-Yannai et al. (1996) andZhang (1998) showed that nitroxides (50 mg/kg i.v.) reduced edema, ameliorated BBB disruption, and markedly improved outcome when administered within a therapeutic window of 4 h after CHI in rats. In a multicenter, randomized controlled trial, polyethylene glycol-conjugated SOD therapy (pegorgotein) failed to improve outcome of patients with severe head injury, when given within 8 h after injury (Young et al., 1996). This relatively long therapeutic time window may explain the failure of SOD to exhibit a protective effect in this clinical trial. Spin-trap scavenging agents are molecules (usually with a nitrone moiety) that have been used in electron paramagnetic studies for trapping highly reactive, unstable radicals. These compounds have been shown to protect experimental animals from pathology, mainly associated with ischemia-reperfusion injury, physical trauma, and aging (Carney et al., 1991; Hensley et al., 1997). Phenyl-α-tert-butyl nitrone (PBN) is a synthetic antioxidant capable of scavenging oxygen- and carbon-based free radicals (Kotake, 1999). In gerbils given PBN before brain ischemia-reperfusion injury, survival significantly improved as compared with controls (Carney and Floyd, 1991). Preischemic systemic administration of 100 mg/kg PBN, combined with 100 mM topical PBN, produced a significant attenuation of hydroxyl radical adduct during ischemia-reperfusion injury of rat brain (Sen and Phillis, 1993). PBN was shown to reduce the infarct size after transient MCA occlusion in rats (Zhao et al., 1994) and to improve the recovery of brain energy state when given 1 h after reperfusion (Folbergrova et al., 1995). It was shown to reduce neuronal necrosis in the neocortex when given 30 min postischemia but not when given before or 6 h after the ischemic event (Pahlmark and Siesjo, 1996). PBN also attenuated the secondary mitochondrial dysfunction after transient focal cerebral ischemia in rats when given 1 h after the start of recirculation (Kuroda et al., 1996).Schultz et al. (1997) reported that PBN administration (25 mg/kg i.v.) 5 min before and 30 min after MCA occlusion in rats provided protection of the vascular endothelium, leading to enhanced postischemic reperfusion. To promote these molecules for clinical applications, intensive toxicity studies should be preformed. These agents should be design for short therapeutic time windows to combat the earlier ischemic events. NAC is a thiol-containing compound used in clinical practice since the mid-1950s. NAC has been demonstrated to effectively reduce free radical species and other oxidants, especially OH and H2O2 (Moldeus et al., 1986). NAC is not synthesized endogenously and cannot cross the BBB after exogenous administration. This fact limits the efficacy of NAC in vivo. Animal studies (mostly rodent models) have indicated that NAC may be beneficial in the treatment of ischemia-reperfusion-induced oxidant injury in a variety of tissues. NAC has been shown to have a neuroprotective capacity during periods of transient forebrain or hippocampal ischemia in rats. However, the efficacy of the drug decreased as the duration of the ischemic period increased (Knuckey et al., 1995). Another recent study showed that preischemic administration ofS-allylcysteine, another cysteine-containing compound, inhibits free radical production, lipid peroxidation, and neuronal damage in MCA occlusion model in rats (Numagami and Ohnishi, 2001). Because NAC was used and demonstrated to be helpful in various non-neurological diseases, its brain-penetrated derivates should be developed and employed in stroke. GSH is a ubiquitous tri-peptide formed from three amino acids—glutamate, glycine, and cysteine—and synthesized by two ATP-dependent enzymatic reactions (Richman and Meister, 1975;Meister and Anderson, 1983). It can also be generated from metabolism of NAC. GSH has major intracellular antioxidant activity, mainly due to the thiol group within the molecule. It plays a critical role in detoxification of peroxides and electrophilic toxins as a substrate for GSH peroxidase and GSH transferase (Larsson et al., 1983; Meister and Anderson, 1983). It was shown that GSH depletion (e.g., by buthionine sulfoximine, which inhibits γ-glutamylcysteine synthetase, the producing enzyme of GSH) enhances cerebral ischemic injury in rats (Mizui et al., 1992).Shivakumar et al. (1995) showed that GSH levels were decreased in brain regions during reperfusion for 1 h after moderate or severe ischemia for 0.5 h. However, Zaidan and Sims (1996) showed a 150% increase in GSH levels in the mitochondria after 30 min of forebrain ischemia in rats. Thus, rapid restoration of thiol homeostasis in the brain during reperfusion may help the brain recover from ischemia-reperfusion injury. The glutathione analog YM737 was shown to reduce lethality, increase brain-water levels, and decrease malondialdehyde levels in cerebral ischemic rats when given immediately after ischemia, suggesting that its anti-ischemic effects are due, in part, to inhibition of lipid peroxidative responses (Yamamoto et al., 1993). These short therapeutic time windows for intervention in GSH system make the task of repeating these results in clinical trials even more difficult. Free metal ions are associated with the pathology of various neurodegenerative diseases (e.g., copper in Wilson's disease and iron in the substantia nigra in Parkinson's disease). Therefore, proteins that are involved in the binding of metal ions were suggested to act as antioxidants. These may include transferrin (binds iron), ceruloplasmin (binds copper), and hemopexin (binds heme, a catalyst in oxidative reactions). Desferral, a potent chelator of redox-active metals, was shown to facilitate the clinical recovery of traumatized rats in a model of CHI (Zhang et al., 1998). Deferoxamine, an iron catalyst in the generation of free radicals and lipid peroxides, given prior or soon after the ischemic episode improved survival and physiological functions in rats (Palmer et al., 1994), dogs (Hurn et al., 1995), and mice (Sarco et al., 2000). However, Fleischer et al. (1987) did not find any benefit of deferoxamine in complete cerebral ischemia in dogs. In an experimental model of SAH (Vollmer et al., 1991), the administration of deferoxamine 16 h before the induction of SAH, showed a consistent attenuation of vascular contraction of cerebral vessels of 77%. The significance of these results to clinical practice in stroke and other OS-involved diseases is quite limited, due to the short therapeutic time windows. Because metal ions have an important role in many enzyme activities, such intervention may be toxic and limit the clinical applications. Uric acid is a waste product of the living cell, which is produced by xanthine oxidase. It is widely distributed in relatively high concentrations throughout the body. Urate contributes up to 60% of the total plasma antioxidant activity in healthy subjects (Wayner et al., 1987, Benzie, 1996). It acts as an antioxidant by interacting with 10 to 15% of the hydroxyl radicals produced daily and by efficiently scavenging both peroxyl radicals and singlet oxygen (Ames et al., 1981). It also binds iron (Davies et al., 1986) and acts indirectly by stabilizing plasma ascorbate (Sevanian et al., 1991). In contrast, Benzie and Strain (1996) hypothesized that urate at high concentrations acts as a pro-oxidant and suggested that hyperuricemia is a risk factor for oxidative stress-associated disorders. It was shown that the cerebral uric acid level increases 10-fold after experimental CHI in rats 24 and 48 h after injury (Tayag et al., 1996). Administration of uric acid to rats either 24 h before MCA occlusion (62.5 mg/kg, i.p.) or 1 h after reperfusion (16 mg/kg, i.v.) resulted in a highly significant reduction of ischemic damage to cerebral cortex and striatum. Uric acid also improved the behavioral outcome in these rats (Yu et al., 1998). Implementation of these results to clinical practice is quite limited, due to the above short therapeutic time windows. Creatine (N-[aminoiminomethyl]-N-methyl glycine) is a tri-peptide endogenously produced from glycine, methionine, and arginine in the liver, kidney, and pancreas (McArdle et al., 1999). Creatine can be found in the muscle, but also in brain tissue (Mujika and Padilla, 1997). Recent experimental findings have demonstrated that creatine provides significant neuroprotection against ischemic and oxidative insults (Holtzman et al., 1998; Balestrino et al., 1999).Sullivan et al. (2000) showed that chronic administration of creatine ameliorated the extent of cortical damage by as much as 36% in mice and 50% in rats after experimental traumatic brain injury. The protection seemed to be related to creatine-induced maintenance of mitochondrial bioenergetics. Mitochondrial membrane potential was significantly increased, intramitochondrial levels of ROS and calcium were significantly decreased, and ATP levels were maintained. This new agent should be intensively investigated before clinical studies for acute CNS injury are performed. Lazaroids are 21-aminosteroids derived from glucocorticosteroids, but they lack glucocorticoid and mineralocorticoid activities. They scavenge lipid peroxyl radicals and inhibit iron-dependent lipid peroxidation (Hall, 1995). Tirilazad mesylate (U-74006F), one of the lazaroid series, is a lipophilic compound with a high affinity for vascular endothelium (Hall et al., 1994). It was shown to protect the BBB against traumatic or SAH-induced permeability. The penetration of tirilazad to brain parenchyma is enhanced after acute CNS injury and disruption of the BBB (Hall et al., 1994). Ischemia. Lazaroids were shown to protect against ischemic damage in several species (Hall and Braughler, 1989; Hall, 1995; Clark et al., 1995). Tirilazad provided a neuroprotective effect in animal model systems of focal cerebral ischemia-reperfusion injury to the brain or spinal cord (Braughler and Hall, 1989; Xue et al., 1992; Park, 1994; Hall, 1995). It has been demonstrated to decrease infarct size secondary to permanent MCA occlusion in rats (Beck and Bielenberg, 1991; Park and Hall et al., 1994) and cats (Silvia et al., 1987). It improved both 24- and 48-h survival in gerbils subjected to 3 h of unilateral carotid occlusion (Hall et al., 1988). Other studies have shown that the novel lazaroid LY231617 protects against ischemia-induced neuronal damage in rat models of global cerebral ischemia (Clemens et al., 1993; O'Neill et al., 1997). Subarachnoid hemorrhage. Tirilazad mesylate prevented SAH-induced chronic vasospasm in a rabbit model (Zuccarello et al., 1989). Intravenous administration of the 21-aminosteroid U74389G, another potent inhibitor of lipid peroxidation and a free radical scavenger, in a dog model of SAH has significantly decreased vasospasm (Macdonald et al., 1998). Closed head injury. Administration of a single i.v. dose (0.003–30 mg/kg) of tirilazad mesylate produced a significant improvement in the neurological status 1 h postinjury in head-injured mice (Hall, 1988a). Similarly, it reduced BBB disruption in a controlled cortical impact injury rat model (Smith et al., 1994) and attenuated post-traumatic mortality and brain edema (Mcintosh et al., 1992; Sanada et al., 1993). Spinal cord injury. Tirilazad has been reported to improve the neurological recovery of cats after a moderately severe compression injury to the lumbar spinal cord (Anderson et al., 1988,1991; Hall, 1988b). It also improved the subacute neurological recovery of rats subjected to a compression spinal injury (Holtz and Gerdin, 1991). After demonstrating its cerebroprotective efficacy in animal models, tirilazad has been clinically evaluated in acute human neurological disorders. Subarachnoid hemorrhage. In two very similar multicenter trials of tirilazad in SAH, one in Europe, Australia, and New Zealand and the other in North America, conflicting results have been reported.Kassel et al. (1996) showed reduced mortality in patients treated with tirilazad (6 mg/kg/d for 10 days) and a better 3-month neurological outcome compared with those given placebo. Gender differences were observed, probably due to the pharmacokinetics of tirilazads, which is metabolized by the P450 enzyme system in the liver (Fleishaker et al., 1995). In contrast, Haley et al. (1997) found no differences between the tirilazad and placebo groups. These conflicting results can be explained by differences in patient admission characteristics, standard of care, or the use of anti-convulsive drugs, which decreases the bioavailability of tirilazad. Closed head injury. Two large multicenter trials of tirilazad in moderate and severe closed head injury failed to show any clear differences in outcome between the treated and the placebo groups (Marshall et al., 1998; Maas et al., 1999). Spinal cord injury. Treatment with tirilazad (2.5 mg/kg every 6 h for 2 days) seemed to have equal efficacy compared with 24-h infusion of methylprednisolone in acute spinal injury patients (Bracken et al., 1997). Huang et al. (2001) suggested that although the lazaroid compounds inhibit lipid peroxidation, they do not reduce the frequency of deoxyribonucleic acid (DNA) damage, adenosine tri-phosphate depletion, or loss of cell replication, which occurs later. One of the major problems concerning the use of 21-aminosteroids as neuroprotective agents is that they have low oral bioavailability and brain uptake (Hall, 1991; Raub et al., 1993). Due to the conflicting results, more experimental and clinical data is needed to elucidate whether lazaroids can be used in acute CNS injury. Two recent studies using nicaraven (also called AVS (±)-N,N′-propylenedinicotinamide), a hydroxyl radical scavenger, confirmed its antivasospastic and brain-protective activities, accompanied by improved cerebral blood flow and glucose use in a rat model of SAH (Germano et al., 1998;Yamamoto et al., 2000). Nicaraven has been tried in a prospective, placebo-controlled, double-blind, multicenter trial (Asano et al., 1996) for evaluation as an antivasospastic agent in SAH. Nicaraven seemed to reduce symptomatic vasospasm significantly (34.5%) and improved Glasgow outcome scale at 1 month. At 3 months, the differences in the Glasgow outcome scale between the groups became marginal, but the percentage of good outcome tended to increase, and the cumulative incidence of death was significantly reduced. In vivo models of oxidative injury in mice (Hall et al., 1997) and ischemia models in rats (Schmid-Elasesser et al., 1997) have recently shown some efficacy of the novel 2,4-diamino-pyrrolo [2,3-d] pyrimidines. These molecules, administered orally, were identified as having a much greater BBB penetration capacity (Hall et al., 1997) and high-lipophilic antioxidant activity with protective effects (Bundy et al., 1995). It has been well established that alterations in polyamines (e.g., spermidine and spermine), which are potent antioxidants and anti-inflammatory agents, occur in animal models of focal and global ischemia and traumatic brain injury (Johnson, 1998).Gilad and Gilad (1991, 1992) found that polyamines could protect against ischemia-induced nerve cell death in the gerbil forebrain. This is a free radical scavenger that was shown to inhibit in vitro both nonenzymatic lipid peroxidation and lipoxygenase activity. MCI-186 (3 mg/kg, i.v.) markedly attenuated the ischemic and postischemic brain swelling after MCA-O (3 and 6 h of ischemia) and reperfusion in rats (Abe et al., 1988). An increasing amount of evidence suggests that OS is important in either the primary or the secondary pathophysiological mechanisms underlying acute CNS injury. In addition, reduction in the endogenous antioxidant defense system due to environmental and genetic factors may contribute to OS evolution. Therefore, the discovery and development of potent antioxidant agents has been one of the most interesting and promising approaches in the search for treatment of CNS injury. Antioxidants of varying chemical structures have been investigated as therapeutic agents in the treatment of acute CNS injury (Table1). Although some of the antioxidants showed efficiency in animal models, most of them did not show beneficial effect in clinical trials performed to date (Table2). To achieve efficacy, the antioxidant must be given during the “time window” available between the vascular event and irreversible neuronal loss. They also should fit to the precise OS physiology, e.g., the type of ROS involved, the place of generation, and the severity of the damage. Moreover, antioxidants must penetrate the BBB to attain a critical therapeutic level within the CNS. Thus, pharmacotherapy for closed head injury and SAH is less problematic than for other acute CNS injuries, because there is obvious disruption of the BBB, enabling easier drug penetration to the brain. Potential reasons for antioxidant failure to achieve neuroprotection in clinical trials include narrow “time window”, suboptimal drug dose, inappropriate drug levels at the target CNS site, and discrepancy in drug mechanism and pathophysiological processes (Table3). Antioxidants may have differential effects in protecting nucleic acids, proteins, and lipids from free radical damage and some compounds may be preferentially localized within specific subcellular organelles. Thus, antioxidant cocktails or antioxidants combined with other drugs such as calcium antagonists, glutamate antagonists, or anti-apoptotic agents, may have more successful synergistic effects. Better understanding of the underlying pathologic al mechanisms of acute CNS injury and improvement of the molecular design of antioxidants will open a full spectrum of possibilities for treatment of various types of injuries. This study was supported in part by the National Parkinson Foundation, Inc., United States, and the Norma and Alan Aufzein Chair for Research in Parkinson Disease, Tel Aviv University, Israel. (1988) Strong attenuation of ischemic and postischemic brain edema in rats by novel free radical scavenger. Stroke 19:480–485. (1983) Does consumption of fruit and vegetables protect against stroke? Lancet 8335:1191–1193. (1981) Uric acid provides an antioxidant defense in humans against oxidant and radical caused aging and cancer: a hypothesis. Proc Natl Acad Sci USA 73:6858–6862. (1988) Effects of treatment with U-74006F on neurological recovery following experimental spinal cord injury. J Neurosurg 69:562–567. (1991) Effects of delayed administration of U-74006F (tirilazad mesylate) on recovery of locomotor function following experimental spinal cord injury. J. Neurotrauma 8:187–192. (1996) Effects of a hydroxyl radical scavenger on delayed ischemic neurological deficits following aneurysmal subarachnoid hemorrhage. J Neurosurg 84:792–803. (1992) Mouse model of focal cerebral ischemia for screening neuroprotective drug effects. J Pharmacol Methods 27:27–32. (1999) Exogenous creatine delays anoxic depolarization and protects from hypoxic damage: dose effect relationship. Brain Res 816:124–130. (1995) Coenzyme Q content in synaptic and non-synaptic mitochondria from different brain regions in the aging rats. Mech Ageing Dev 78:173–187. (1991) The effects of two 21-aminosteroids on overt infarct size 48 hours after middle cerebral artery occlusion in the rat. Brain Res 560:159–162. (1996) Cerebroprotective effect of stable nitroxide radicals in closed head injury in the rat. Brain Res 717:22–28. (1993) Biological functions of dietary carotenoids. Ann NY Acad Sci 691:61–67. (1984) Elevation of the extracellular concentrations of glutamate and aspartate in rat hippocampus during transient cerebral ischemia monitored by intracerebral microdialysis. J Neurochem 43:1369–1374. (1996) Lipid peroxidation: a review of causes, consequences, measurement and dietary influences. Int J Food Sci Nutr 47:233–262. (1996) Uric acid: friend or foe. Redox Report 2:231–234. (1998) Antioxidant properties of melatonin—an emerging mystery. Biochem Pharmacol 56:1265–1272. (1992) An analysis of the role of coenzyme Q in free radical generation and as antioxidant. Biochem Cell Biol 70:390–403. (1985) Tissue coenzyme Q (ubiquinone) and protein concentrations over the life span of the laboratory rat. Mech Ageing Dev 32:267–281. (1993) Nutrition intervention trials in Linx-ian China: supplementation with specific vitamin/mineral combination, cancer incidence, and disease-specific mortality in the general population. J Natl Cancer Inst 85:1483–1493. (1995) The relation of oxidative stress and hyperexcitation to neurological disease. Proc Soc Exp Biol Med 208:337–345. (2000) Glial survival is enhanced during melatonin-induced neuroprotection against cerebral ischemia. FASEB J 14:1307–1317. (1992) Effects of excitotoxins on free radical indices in mouse brain. Toxicol Lett 60:211–219. (1997) Administration of methylprednisolone for 24 or 48 hours or tirilazad mesylate for 48 hours in the treatment of acute spinal cord injury: results of the Third National Acute Spinal Cord Injury Randomized Controlled Trial. JAMA (J Am Med Assoc) 277:1597–1604, for the National Acute Spinal Cord Injury Study. (1989) Central nervous system trauma and stroke. I. Biochemical considerations for oxygen radicals and lipid peroxidation. Free Radic Biol Med 6:289–309. (1989) Increased lipid peroxidation in vulnerable brain regions after transient forebrain ischemia. Stroke 20:918–924. (1995) Primary prevention of stroke. N Engl J Med 333:1392–1400. (1995) Massive persistent release of excitatory amino acids following human occlusive stroke. Stroke 26:2187–2189. (1995) Synthesis of novel 2,4 diaminopyyrrolo-[2,3-d] pyrimidines with antioxidant neuroprotective and antiasthma activity. J Med Chem 38:4161–4163. (1995) The free radical scavenger alpha-lipoic acid protects against cerebral ischemia-reperfusion injury in gerbils. Free Radic Res 23:365–370. (1991) Protection against oxidative damage to CNS by alpha-phenyl-tert-butyl nitrone (PBN) and other spin trapping agents: a novel series of nonlipid free radical scavengers. J Mol Neurosci 3:47–57. (1991) Reversal of age-related increase in brain protein oxidation, decrease in enzyme activity, and loss in temporal and spacial memory by chronic administration of the spin trapping compound N-tert-butyl-alpha-phenylnitrone. Proc Natl Acad Sci USA 88:3633–3636. (1993) Superoxide and nitric oxide cooperation in hypoxia/reoxygenation-induced neuron injury. Free Radic Biol Med 14:389–395. (1993) Partners in defense. Vitamin E and vitamin C. Can J Physiol Pharmacol 7:725–731. (1998) Plasma levels of antioxidant vitamins, selenium, total sulfhydryl groups and oxidative products in ischemic-stroke patients as compared to matched controls in Taiwan. Free Radic Res 28:15–24. (1995) CNS pharmacology and current research. Drugs 50:971–983. (1993) The antioxidant LY231617 reduces global ischemic neuronal injury in rats. Stroke 24:716–723. (1993) Oxidative stress, glutamate and neurodegenerative disorders. Science (Wash DC) 262:689–695. (1997) Duration of glutamate release after acute ischemic stroke. Stroke 28:708–710. (1986) Uric acid-iron complexes. Biochem J 235:747–754. (1997) Dietary vitamin C, beta-carotene and 30-year risk of stroke: results from the western electric study. Neuroepidemiology 16:69–77. (1995) The neuroprotective efficacy of ebselen (aglutathione peroxidase mimic) on brain damage induced by transient focal cerebral ischemia in the rat. Neurosci Lett 185:65–69. (2001) Primary stroke prevention. Eur J Neurol 8:1–15. (1988) Physiological antioxidants and antioxidative enzymes in vitamin E-deficient rats. Toxicol Lett 44:47–54. (1991) Accumulation of amino acids and hydroxyl free radicals in brain and retina of gerbil after transient ischemia. J Ocular Pharmacol 7:147–155. (2001) Malondialdehyde, glutathione peroxidase and superoxide dismutase in peripheral blood erythrocyres of patients with acute cerebral ischemia. Eur J Neurol 8:43–51. (1999) Pathobiology of ischemic stroke: an integrated view. Trends Neurosci 22:391–397. (1996) Enhanced sensitivity of ubiquinone-deficient mutants of saccharomyces cerevisiae to products of autooxidized polyunsaturated fatty acid. Proc Natl Acad Sci USA 93:7534–7549. (1998) Vitamin E enhances Ca (2+)-mediated vulnerability of immature cerebellar granule cells to ischemia. Free Radic Biol Med 25:793–802. (1996) Oxidative stress and antioxidant theory in Parkinson's disease. Prog Neurobiol 48:1–19. (1995) Biochemical, physiological and medical aspects of ubiquinon function. Biochem Biophys Acta 127:195–204. (1993) Free radicals in brain metabolism and pathology. Br Med Bull 49:577–587. (1998) Free radicals as mediators of neuronal injury. Cell Mol Neurobiol 18:667–682. (1989) The role of excitatory amino acids and NMDA receptors in traumatic head injury. Science (Wash DC) 244:798–800. (1994) The role of free radicals in NMDA-dependent neurotoxicity. Prog Brain Res 103:381–390. (1987) Failure of deferoxamine, an iron chelator, to improve neurologic outcome following complete cerebral ischemia in dogs. Stroke 18:124–127. (1995) Effect of gender and menopausal status on the pharmacokinetics of tirilazad mesylate in healthy subjects. Am J Ther 2:553–560. (1995) N-tert-butyl-alpha-phenylnitrone improves recovery of brain energy state in rats following transient focal ischemia. Proc Natl Acad Sci USA 92:5057–5061. (1997) Lipid peroxidation and changes in the ubiquinone content and the respiratory chain enzymes of submitochodrial particles. Free Radic Biol Med 22:391–400. (1989) Ascorbate is an outstanding antioxidant in human blood plasma. Proc Natl Acad Sci USA 86:6377–6381. (1998) Oxidative stress in the human brain after subarachnoid hemorrhage. J Neurosurg 89:748–754. (1997) The pathobiology of traumatic brain injury. The Neuroscientist 3:73–81. (1998) Antivasospastic and brain-protective effects of a hydroxyl radical scavenger (AVS) after experimental subarachnoid hemorrhage. J Neurosurg 88:1075–1081. (1993) Poor plasma status of carotene and vitamin C is associated with higher mortality from ischemic heart disease and stroke: basel prospective study. Clin Investig 71:3–6. (1991) Polyamines can protect against ischemia-induced nerve cell death in gerbil forebrain. Exp Neurol 111:349–355. (1991) Polyamines in neurotrauma ubiquitous molecule in search of a function. Biochem Pharmacol 44:401–407. (1994) The concept of the therapeutic window: a synthesis of critical issues. in Proceedings of the Nineteenth Princeton Conference on Cerebrovascular Disease, ed Moskowitz MA (Butterworth-Heinemann, Stoneham, MA). (1997) Oral coenzyme Q10 administration prevents the development of ischemic brain lesions in rabbit model of symptomatic vasospasm. Acta Neuropathol 94:363–368. (1992) Therapeutic opening of the blood brain barrier in man (Bradbury MWB ed) pp 525–542, Springer-Verlag, New York. (1985) Ischemia-induced shift to inhibitory and excitatory amino acids from intra- to extra-cellular compartments. J Cereb Blood Flow Metab 5:413–419. (1997) A randomized, double blind, vehicle-controlled trial of tirilazad mesylate in patients with aneurysmal subarachnoid hemorrhage: a cooperative study in North America. J Neurosurg 86:467–474. (1988a) Effects of the 21-aminosteroid U-74006f on experimental head injury in mice. J Neurosurg 68:456–461. (1988b) Effects of the 21-aminosteroid U-74006f on posttraumatic spinal cord ischemia in cats. J Neurosurg 68:462–465. (1991) Free radicals and CNS injury. Crit Care Clin 5:793–805. (1995) Inhibition of lipid peroxidation in central nervous system trauma and ischemia. J Neurol Sci 134 (Suppl) 79–83. (1997) Pyrrolopyrimidnes novel brain penetrating antioxidants with neuroprotective activity in brain injury and ischemia models. J Pharmacol Exp Ther 281:895–904. (1989) Central nervous system trauma and stroke, physiological and pharmacological evidence for the involvement of oxygen radicals and lipid peroxidation. Free Radic Med 6:303–313. (1994) Therapeutic potential of the lazaroids (21-aminosteroids) in acute central nervous system: trauma, ischemia and subarachnoid hemorrhage. Adv Pharmacol 28:221–268. (1988) 21-Aminosteroid U-74006F protects against cerebral ischemia in gerbils. Stroke 19:997–1002. (1994) Free radicals, antioxidants, and human disease: curiosity, cause or consequence? The Lancet 344:721–724. (1997) Antioxidants: the basics—what they are and how to evaluate them. Adv Pharmacol 38:3–20. (1989) Free Radicals in Biology and Medicine (Clarendon Press, Oxford), 2nd ed. (1992) Potentiation of quinolinate-induced hippocampal lesions by inhibition of NO synthesis. Neurosci Lett 146:187–190. (1983) Functional recovery of cortical neurons as related to degree and duration of ischemia. Ann Neurol 14:294–301. (1996) Lack of effect of long-term supplementation with beta-carotene on the incidence of malignant neoplasms and cardiovascular disease. N Engl J Med 334:1145–1155. (1997) Nitrone-based free radical traps as neuroprotective agents in cerebral ischemia and other pathologies. Int Rev Neurobiol 40:299–317. (1991) Blocking weight induced injury in rats: therapeutic effect of 21-aminosteroid U-74006F. Neurotrauma 8:239–245. (1998) Creatine increases survival and suppress seizures in the hypoxic immature rat. Pediatr Res 44:410–414. (2001) Lazaroid compounds prevent early but not the late stages of oxidant induced cell injury: potential explanation for the lack of efficacy of lazaroid in clinical trials. Pharmacol Res 43:55–61. (1995) Deferoxamine reduces early metabolic failure associated with severe cerebral ischemic acidosis in dogs. Stroke 26:688–694. (1999) Glial cells protect neurons against oxidative stress via transcriptional up-regulation of glutathione synthesis. J Neurochem 72:2344–2344. (1996) Oxidative stress and the pathogenesis of Parkinson's disease. Neurology 47 (Suppl) S161–S176. (1998) Polyamines and cerebral ischemia. Prog Drug Res 50:193–258. (1990) Effects of ebselen (PZ51) on ischemic brain edema after focal ischemia in cats. Acta Neurochir 51 (Suppl) 239–241. (1981) Thresholds of focal cerebral ischemia in awake monkeys. J Neurosurg 54:773–782. (1999) Fruit and vegetable intake in relation to risk of ischemic stroke. JAMA (J Am Med Assoc) 282:1233–1239. (1989) Age related changes in the lipid composition of rat and human tissues. Lipids 24:579–584. (1991) Temporal thresholds for neocortical infarction in rats subjected to reversible focal cerebral ischemia. Stroke 22:1032–1039. (1996) Randomized, double blind, vehicle-controlled trial of tirilazad mesylate in patients with aneurysmal subarachnoid hemorrhage: a cooperative study in Europe, Australia, and New Zealand. J Neurosurg 84:221–228. (1997) Antioxidant OPC-14117, attenuates edema formation and behavioral deficits following cortical contusion in rats. Acta Neurochir 70 (Suppl) 191–193. (1996) Dietary flavonoids, antioxidant vitamins, and incidence of stroke: the Zutphen study. Arch Intern Med 156:637–642. (1999) Pinealectomy aggravates and melatonin administration attenuates brain damage in focal ischemia. J Cereb Blood Flow Metab 19:511–516. (1995) N-Acetylcysteine enhances hippocampal neuronal survival after transient forebrain ischemia in rats. Stroke 26:305–310. (1999) Pharmacologic properties of phenyl N-tert-butylnitrone. Antioxid Redox Signal 1:481–499. (1996) Delayed treatment with alpha-phenyl-tert-butyl nitrone (PBN) attenuates secondary mitochondrial dysfunction after focal cerebral ischemia in the rat. Neurobiol Dis 3:149–157. (1983) Functions of Glutathione. Biochemical Physiological Toxicological and Clinical Aspects (Raven Press, New York). 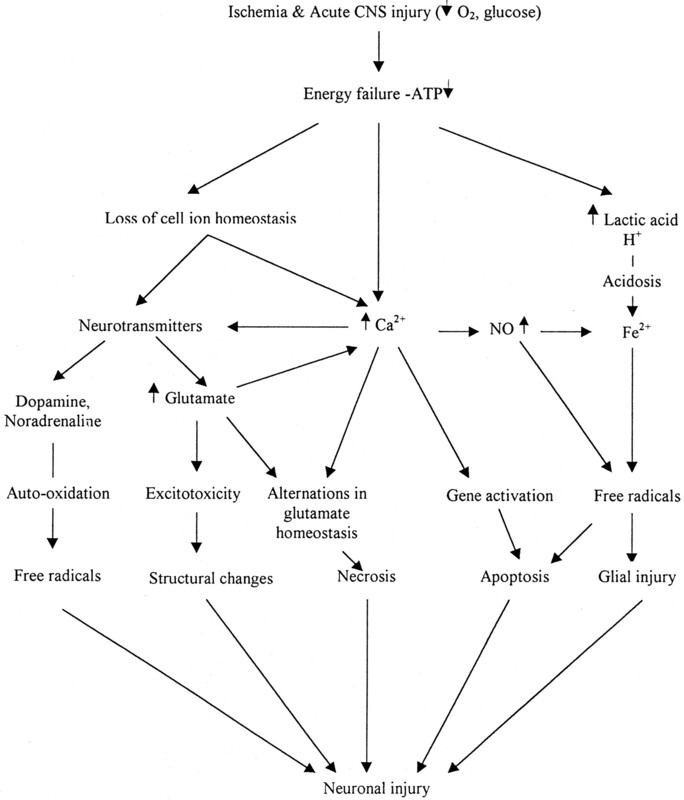 (2000) Free radical pathway in CNS injury. J Neurotrauma 17:871–890. (1999) Protective effect of melatonin on injured cerebral neurons is associated with bcl-2 protein over-expression. Zhongguo Yaoli Xuebao 20:409–414. (1999) Oxidative stress in brain ischemia. Brain Pathol 9:119–131. (1999) Why have recent trials of neuroprotective agents in head injury failed to show convincing efficacy. A pragmatic analysis and theoretical considerations. Neurosurgery 44:1286–1298. (1998) U74389G prevents vasospasm after subarachnoid hemorrhage in dogs. Neurosurgery 42:1339–1346. (1996) Increased brain damage after stroke or excitotoxic seizures in melatonin-deficient rats. FASEB J 10:1546–1551. (1998) A multicentral on the efficacy of using tirilazad mesylate in cases of head injury. J Neurosurg 89:519–525. (2001) NFκB in neuronal plasticity and neurodegenerative disorders. J Clin Invest 107:247–254. (1999) Sports and Exercise Nutrition. (Lippincott Williams & Wilkins, Philadelphia). (1992) The novel 21-aminosteroid U-74006F attenuates cerebral edema and improved survival after brain injury in the rat. J Neurotrauma 9:33–46. (1983) Glutathione. Annu Rev Biochem 52:711–760. (1992) Penumbral tissues salvaged by reperfusion following middle cerebral artery occlusion in rats. Stroke 23:552–559. (1992) Depletion of brain glutathione by buthionine sulfoximine enhances cerebral ischemic injury in rats. Am J Physiol 262:H313–H317. (1986) Lung protection by a thiol containing antioxidant N-acetylcysteine. Respiration 50:531–542. (1997) Creatine supplementation as an ergogenic acid for sports performance in highly trained athletes: a critical review. Int J Sports Med 18:491–496. (1984) A novel biologically active seleno-organic compound. I. Glutathione peroxidase like activity in vitro and antioxidant capacity of PZ51 (Ebselen). Biochem Pharmacol 33:3235–3239. (1994) Relations between tocopherol depletion and coenzyme Q during lipid peroxidation in rat liver mitochondria. Free Radic Res 20:375–386. (2001) S-Allylcysteine inhibits free radical production, lipid peroxidation, and neuronal damage in rat brain ischemia. J Nutr 131:1100S–1105S. (1999) Ebselen in acute middle cerebral artery occlusion: a placebo-controlled double-blind clinical trial. Cerebrovas Dis 9:112–118. (1986) Survival effect of coenzyme Q10, and naloxone on experimental stroke. Pharmacol Biochem Behav 24:315–317. (1990) Oxidative damage to brain proteins, loss of glutamine synthetase activity, and production of free radicals during ischemia/reperfusion-induced injury to gerbil brain. Proc Natl Acad Sci USA 87:5144–5157. (1997) Neuroprotective effect of the antioxidant LY231617 and NO synthase inhibitors in global cerebral ischemia. Brain Res 760:170–178. (1992) New horizons in antioxidant research: action of the thioctic acid/dihydrolipoic acid couple in biological systems. in Thioctsaure. 2nd International Thictic Acid Workshop, eds Schmidt K, Ulrich H (Universimed Verlag GmbH, Frankfurt, Germany), pp 35–44. (1998) alpha-Lipoic acid: a metabolic antioxidant which regulates NF-kappa B signal transduction and protects against oxidative injury. Drug Metab Rev 30:245–275. (1997) Neuroprotection by the metabolic antioxidant and α-lipoic acid. Free Radic Biol Med 22:359–378. (1990) Cellular functions of ascorbic acid. Biochem Cell Biol 68:1166–1173. (1996) Effect of the spin trap-alpha-phenyl-N-tert-butyl nitrone (PBN) in transient forebrain ischemia in the rat. Acta Physiol Scand 157:41–51. (1994) Deferoxamine post-treatment reduces ischemic brain injury in neonatal rats. Stroke 25:1039–1045. (1994) Dose response analysis of the tirilazad mesylate (U-74006F) upon neurological outcome and ischemic brain damage in permanent focal cerebral ischemia. Brain Res 645:157–163. (1990) Excitatory amino acids release and free radical formation may cooperate in the genesis of ischemia-induced neuronal damage.J Neurosci 10:1035–1041. (1992) Dihydrolipoate reduces neuronal injury after cerebral ischemia. J Cereb Blood Flow Metab. 12:78–87. (1992) Pathophysiology of stroke. Lancet 339:533–536. (1995) The therapeutic window in ischemic brain injury. Curr Opin Neurol 8:3–5. (1993) Use of biophysical-kinetic model to understand the roles of protein binding and membrane partitioning on passive diffusion of highly lipophilic molecules across cellular barriers. J Drug Target 1:269–286. (1967) Fine structural localization of a blood brain barrier to exogenous peroxidase. J Cell Biol 34:207–217. (2000) Ascorbate regulation and its neuroprotective role in the brain. Trends Neurosci 23:209–216. (1998) Differential compartmentalization of brain ascorbate and glutathione between neurons and glia. Neuroscience 82:1213–1223. (1975) Regulation of gamma-glutamyl-cystein, synthetase by non allosteric feedback inhibition by glutathione. J Biol Chem 250:1422–1426. (1993) Biology of free radical scavengers: an evaluation of Ascorbate. FASEB J 7:1135–1142. (1992) Cerebrospinal fluid: blood brain barrier oedema and hydrocephalus. in Principles of Neural Science, eds Kandel ER, Schwartz JH, Jessle T (Elsevier, New York), pp 1050–1060. (1998) Neuroprotective efficacy of an antioxidant ebselen, in patients with delayed neurological deficits after aneurysmal subarachnoid hemorrhage. Neurosurgery 42:269–277. (1993) Effect of U-74006F on neurological function and brain edema after fluid percussion injury in rats. J Neurotrauma 10:65–71. (1993) Hemoglobin potentiates nervous system damage. J Clin Invest 79:662–664. (2000) The neuroprotective effect of deferoxamine in the hypoxic-ischemic immature mouse brain. Neurosci Lett 17:113–116. (1997) Superior neuroprotective efficacy of a novel antioxidant (U-101033E) with improved blood-brain barrier permeability in focal cerebral ischemia. Stroke 28:2018–2024. (1999) NFκB is activated and promotes cell death in focal cerebral ischemia. Nat Med 5:554–559. (1991) Ascorbic acid in the brain. Physiol Rev 40:413–418. (1997) Facilitation of postischemic reperfusion with alpha PBN: assessment using NMR and Doppler flow techniques. Am J Physiol 272:H1986–H1995. (1998) Redox signaling and the emerging therapeutic potential of thiol antioxidants. Biochem Pharmacol 55:1747–1758. (1993) Alpha-phenyl-tert-butyl nitrone (PBN) attenuates hydroxyl radical production during ischemia-reperfusion injury in rat brain: an EPR study. Free Radic Res Commun. 19:255–265. (1991) Serum urate as an antioxidant for ascorbic acid. Am J Clin Nutr 54:1129S–1134S. (2000) Multiple molecular penumbras after focal cerebral ischemia. J Cereb Blood Flow Metab 20:1011–1032. (1995) Glutathione and protein thiol homeostasis in brain during reperfusion after cerebral ischemia. J Pharmacol Exp Ther 274:1167–1173. (1997) Oxidative stress in closed head injury: brain antioxidant capacity as an indicator of functional outcome. J Cereb Blood Flow Metab 17:1007–1019. (1992a) Pathophysiology and treatment of focal cerebral ischemia. Part I: Pathophysiology. J Neurosurg 77:169–184. (1992b) Pathophysiology and treatment of focal cerebral ischemia. Part II: Mechanism of damage and treatment. J Neurosurg 77:337–354. (1993) Basic mechanisms of traumatic brain damage. Ann Emerg Med 22:959–969. (1987) U-74006F, an inhibitor of lipid peroxidation, protects against lesion development following stroke in the cat: histological and metabolic analysis. Soc Neurosci Abstr 13:1499. (1996) Oxidative stress in neurodegenerative diseases. Annu Rev Pharmacol Toxicol l 36:83–106. (1994) Direct measurement of hydroxyl radical levels, lipid peroxidation and blood-brain barrier disruption following unilateral head injury in the rat. J Neurotrauma 11:393–404. (2000) Dietary supplement creatine protects against traumatic brain injury. Ann Neurol 48:723–729. (1992) Recombinant human superoxide dismutase can attenuate ischemic neuronal damage in gerbils. Life Sci 51:253–259. (1997) Neuroprotective efficacy of ebselen an antioxidant with anti-inflammatory actions, in rodent model of permanent middle cerebral artery occlusion. Br J Pharmacol 122:1251–1256. (1996) Cerebral uric acid increases following experimental traumatic brain injury in rat. Brain Res 733:287–291. (1996) Vitamin E in humans. Demand and delivery. Annu Rev Nutr 16:321–347. (1999) Inhibition of iron-dependent and ischemia-induced brain damage by the α-tocopherol analogue MDL 74,722. Exp Neurol 155:103–108. (1992) Vitamin E: neurochemistry and implication for Parkinson's disease. Ann N Y Acad Sci 669:92–110. (1991) A study of the effectiveness of the iron-chelating agent deferoxamine as vasospasm prophylaxis in a rabbit model of subarachnoid hemorrhage. Neurosurgery 28:27–32. (1983) Does consumption of fruit and vegetables protect against stroke? Lancet 8352:8742. (1997) Ebselen (DR3305) ameliorates delayed cvasospasm in a canine two hemorrhage model. Neurol Res 19:563–565. (1987) The relative contributions of vitamin E, urate, ascorbate and proteins to the total peroxyl radical-trapping antioxidant activity of human blood plasma. Biochim Biophys Acta 924:408–419. (1984) A novel biologically active seleno-organic compound. II. Activity of PZ51 in relation to glutathione peroxidase like activity in vitro and antioxidant capacity of. Biochem Pharmacol 33:3241–3245. (1984) Brain injury by ischemic anoxia: hypothesis extension—a tale of two ions? Ann Emerg Med 13:862–867. (1993) Nitric oxide protects against cellular damage and cytotoxicity from reactive oxygen species. Proc Natl Acad Sci USA 90:9813–9817. (1996) Neuroprotective effects of alpha-lipoic acid and its enantiomers demonstrated in rodent models of focal cerebral ischemia. Neuropharmacology 35:369–375. (1992) Tirilazad reduces cortical infarction after transient, but not permanent focal cerebral ischemia in rats. Stroke 23:894–899. (1998) Ebselen in acute ischemic stroke: a placebo-controlled double-blind clinical trial. Ebselen study group. Stroke 29:12–17. (1993) Protective actions of YM737, a new glutathione analog, against cerebral ischemia in rats. Res Commun Chem Pathol Pharmacol 81:221–232. (2000) Improvement in cerebral blood flow and metabolism following subarachnoid hemorrhage in response to prophylactic administration of the hydroxyl radical scavenger, AVS, (±)-N,N′-propylenedinicotinamide. J Neurosurg 92:1009–1015. (2000) Intake of antioxidant vitamin and risk of death from stroke in postmenopausal women. Am J Clin Nutr 72:476–483. (1996) Effects of pegorgotein on neurologic outcome of patients with severe head injury: a multicenter, randomized controlled trial. JAMA 276:538–543. (1998) Uric acid protects neurons against excitotoxic and metabolic insults in cell culture, and against focal ischemic brain injury in vivo. J Neurosci Res 53:613–625. (1996) Alternations in the glutathione content of mitochondria following short term forebrain ischemia in rats. Neurosci Lett 218:75–78. (1998) Mechanism of brain protection by nitroxide radicals in experimental model of closed head injury. Free Radic Biol Med 24:332–340. (1994) Delayed treatment with the spin trap alpha-phenyl-tert-butyl nitrone (PBN) reduces infarct size following transient middle cerebral artery occlusion in rats. Acta Physiol Scand 152:349–350. (1998) Factors determining the therapeutic window for stroke. Neurology 50:599–603. (1989) Effect of the 21-aminosteroid U-74006F on cerebral vasospasm following subarachnoid hemorrhage. J Neurosurg 71:98–104.